Tal Afar (Arabic: تلعفر‎, IPA: [talˈʕafar], Turkish: Telafer) is a city and district in the Nineveh Governorate of northwestern Iraq, 63 km west of Mosul, 52 km east of Sinjar and 200 km north west of Kirkuk. While no official census data exists, the city which had been assessed to have a population of approximately 200,000, had dropped to 80,000, as of 2007, nearly all of whom are Iraqi Turkmen. In Tal Afar itself, the population is mostly Turkmen, about 75 percent of whom were Sunni Muslims, while a quarter were Shi’ites. While most residents can speak Arabic, the Iraqi Turkmen/Turkoman dialect of the Turkish language, is the most common language used throughout the city. 10 kilometres (6.2 mi) southwest of the town of Tal Afar are the mounds of Yarim Tepe which yielded remains from the Halafian culture from the Hassuna, Halaf and Ubaid periods, between 7000 and 4500 BC. From perhaps the 25th century BC through to the 7th century AD it was an integral part of Assyria. Tal Afar has been thought to be a city mentioned in the Bible, Telassar or Thela'sar, mentioned in 2 Kings 19:12 and in Isaiah 37:12 as a city inhabited by "the children of Eden" which was at the time ruled by Sennacherib of Assyria. "After Hafiz Pasha's expedition in 1837 Tall 'Afar was occupied permanently by Turkish troops and started to be used as a base to control the movements of a number of the Yazidi tribes of eastern Sinjar. In the 1880s Tall 'Afar became an administrative unit depending on the Sinjar qadha." Sometime during the Ottoman Empire, the Ottoman Turkish Army founded the city as a sole military outpost constructed on top of a hill. Remains of the fortress can still be seen today. Also garrisoned at the fortress were Turkmen members of the Daloodi tribe who following the withdrawal of the Ottoman Army became the first civilian occupants of the town built around the fortress. After the fall of the Ottoman Empire, Tal Afar was included in Iraq. In 1920, Tal Afar was used as a base of operations for a planned revolt against the then ruling British. Tal Afar is located approximately 50 km west of Mosul and 60 km east of the Iraqi-Syrian border, at coordinate 36°23′N 42°27′E. According to map data, it has a total area of 15 km². Tal Afar is located in the gap between the anticlines of Jabal Zambar to the southeast and Jebel Sasan to the northwest. The city is located in an open desert plain at the southern base of the Aedea Mountains. Much of the terrain surrounding the city is flat desert. A major east–west highway, which spans the Ninawa Governorate and intersects Iraq’s main central north-south highway near Mosul, runs through the city. The city of Tal Afar is organized into eighteen neighborhoods or districts: Sa'ad, Qadisiyah, Todd A-O, Sara, Mohalemeen, Madlomin, Uruba, Wahada, Nida, A'a lot, Hassan Qoi, Mothana, Khadra, Jazeera, Taliha, Kifah, Malain and Qalah (Turkish: Kale). Each neighborhood is able to maintain its identity due to the tribal nature of the city. Several dozen extended families living in close proximity will typically identify with one local sheikh who takes it upon himself to serve as steward of the neighborhood’s citizens and liaison to the local government. The layout of the town consists of densely packed buildings, often constructed so closely to each other that they share common load-bearing walls and supports. The city streets further physically define each neighborhood by separating it from other groups of buildings, since they cut through the town in irregular patterns. The United States Army and local government implemented a home address system to better identify specific locations and define jurisdiction for the Iraqi Police in the second half of the 2000s. Demographically, Tal Afar is isolated from many of the surrounding towns and villages because of its Iraqi Turkmen population. Many people to the west identify themselves as Yazidis, and to the south and east Arabs. Many of the Turkmen of Tal Afar have been displaced and moved to areas further south in Iraq since ISIL captured the area. Many have also joined Iraqi forces fighting ISIL. In January 2007, the largest single employer in the city was the Iraqi Ministry of the Interior, which had hired roughly 2,250 policemen. The second-largest employer was the United States government. The 101st Airborne 3rd Brigade was stationed at Tal Afar Airbase in 2003–04 and its 1st Battalion was stationed in the town proper. Important industries in the region include agriculture, especially the harvesting of wheat, which historically has been processed at the city’s state-run granary, and the production of cement and macadam. Unemployment was estimated to be as high as 80 per cent in August 2006. There is only one hospital in Tal Afar which is Tal Afar General Hospital in addition to Tal Afar Health Sector which includes six health centres (clinics) inside Tal Afar, and other clinics in the periphery. 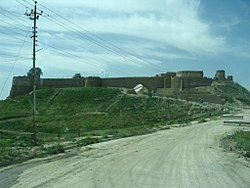 The Tal Afar Citadel, a ruined Ottoman fortress, is located in the center of the city. Local history states that British administrators augmented the structure of the original fortress. During the 2003 invasion of Iraq, the fortress was further augmented and made to house the city’s mayoral, municipal and police headquarters. The neighborhood including and surrounding the fortress is known as Qalah or "Castle". Large parts of the citadel were blown up by the Islamic State of Iraq and the Levant in December 2014. Many residents identify themselves as Iraqi Turkmens/Turkomans and share many similarities with Anatolian Turkish culture. Strong family ties exist between residents of the city and relatives in Turkey. Approximately 20 families live in the city whom identify themselves as Kurdish or Yezidi. Arab culture is also present and many residents don traditional Arab dishdashas and checkered headscarves. Western-style clothing is also common. Cuisine found in the city is similar to meals prepared in Arab/Turkish culture including unseasoned grilled lamb and beef, unleavened bread, rice, vegetable-based soups and indigenous vegetables such as potatoes, tomatoes, raisins and cucumbers. Tal Afar’s local government consists of a city council, local sheikhs and a mayor. The mayor is appointed by the council of sheikhs and confirmed by the provincial regional administrator. The mayor need not be originally from the city nor Iraqi Turkmen. The mayor from 2005 to 2008 was Najim Abdullah Abed al-Jabouri, a Sunni Arab originally from Qayyarah and married to Maria Constantinescu. The Iraqi Turkmen demographic of Tal Afar and its geographic location have made it an important city in the argument for Iraqi federalism. Following a program of "Arabization" initiated by Saddam Hussein in the 1970s, large numbers of Sunni Arabs supportive of the Baathist government were moved into areas around Tal Afar. 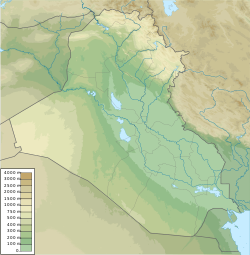 Geographically, the region the city is located in is a border area separating Kurdish lands to the north and Arab lands to the south in the Al Anbar governorate. Soldiers from 416th Civil Affairs Battalion and Turkish military observers speak with local officials are assessing the damages to local infrastructure. During the Iraq War in 2003, insurgents used Tal Afar as a staging point for attacks. On September 9, 2004, a major military operation was launched against Tal Afar by the 3rd Brigade, 2nd Infantry Division (Stryker Brigade Combat Team) and Iraqi Security forces. Fighting continued until September 12, 2004 when the government of Turkey claimed that the fighting had taken the lives of approximately 58 ethnic Turkmen civilians and demanded an end to military operations at which time the civilians camped outside Tal Afar were allowed to return to their homes. American forces defeated the insurgents and left about 500 troops in the city. However, Iraqi authorities lost control of the city in May 2005, and insurgents began taking over again. 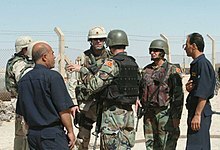 In September 2005, Operation Restoring Rights was conducted in which approximately 5,000 soldiers from the 3rd Division of the Iraqi Security Force in conjunction with 3,500 troops (Bob Woodward sites the number 5,300 troops in his book "The War Within") from the U.S. Army's 3rd Armored Cavalry Regiment and the 325th Airborne Infantry Regiment, 82nd Airborne Division entered the city. The operation resulted in 157 insurgents being killed and 683 captured. Iraqi Security Forces suffered 12 killed and 27 wounded. The operation lasted until October and resulted in 10,000 pounds of explosives being uncovered and destroyed.Abu Musab al-Zarqawi accused the American military of using "poisonous gases" on Tal Afar in an audiotape received and posted on an Islamic website. The United States denied using chemical weapons in Tal Afar saying such reports were propaganda created by al-Zarqawi, and were false and without merit. There was an incident in which US troops wore gas masks after discovering chlorine-based chemicals. The operation tested a new strategy of "clear, hold, build", in which areas would be purged of insurgents and then occupied and then rebuilt to win support from local people before being handed over to the Iraqi security forces. An ambitious reconstruction effort was immediately implemented. New sewers were dug and the fronts of shops, destroyed in the assault, were replaced within weeks. Numerous police stations were built or rebuilt in the town by an Anglo-American construction team led by Huw Thomas. In March 2006, U.S. President George W. Bush pointed to Tal Afar as a success story, where one could "see the outlines of the Iraq we've been fighting for". The operation was considered one of the first successful counterinsurgency operations in Iraq. Colonel H.R. McMaster, commander of the operation became an advisor to General David Petraeus in the planning and execution of the 2007 troop surge. However, after years of intermittent violence, some commentators have said that the optimism expressed in 2005 was overstated. Tal Afar has also been the scene of sectarian violence between Shiite and Sunni Muslims. Before the invasion of Iraq sectarian violence between Turkmens had not been a problem. Their shared cultural background had united Sunni and Shia Turkmens. Political mobilisation in Tal Afar had until then been dominated by the Baath party. With no readily available movement to replace Saddam's Baathists, the collapse of the state disrupting everything from food to security and increasing distrust towards the Shia dominated Iraqi government, tensions started to arise. Grievances were stoked further when Sunni Islamists began to move into the town and Shia Iraqi security forces began purging Sunni's from the police force. In May 2005, clashes broke out between the two groups. In October 2006, a bombing in Tal Afar killed 14 people, of whom ten were civilians and four Iraqi soldiers. An additional bombing, outside a car dealership, on November 24, 2006, killed at least 22 and wounded at least 26. On February 10, 2007 a suicide car bomber killed one Iraqi soldier and wounded five people, including three civilians, as it targeted an army checkpoint. On February 22, 2007 four people were killed, including a policeman and a 12-year-old boy, and five were wounded, including two policemen, when two booby-trapped houses detonated while police were searching homes. During the search, a policeman shot and killed a suspect and wounded two others. Police had already reported the death of one policeman. On March 24, 2007 a suicide bomber in a market in the town killed eight people and wounded ten. On March 27, 2007, a truck bomb exploded in a market in a Shiite area. It was first reported to have killed 83 people and wounded 183, but the Iraqi Interior Ministry later raised the death toll to 152 and said that 347 were wounded, which would make it the deadliest single strike since the war started. The explosion, for which a terrorist group linked to Al Qaeda claimed responsibility, led to reprisal shootings by Shiite policemen and others against Sunnis, in which between 47 and 70 men were killed. 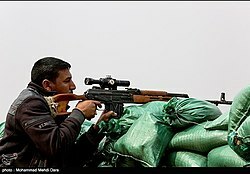 Several Shiite policemen were arrested for taking part in the shootings. On April 14, 2007 a sniper shot dead a woman. On May 21, 2007, a roadside bomb exploded near a police patrol, wounding three policemen on the main road between the town of Sinjar and Tal Afar. On May 31, 2007, a roadside bomb targeting a police patrol wounded four policemen on the road between Sinjar and Tal Afar. In a separate incident a roadside bomb targeting an Iraqi army patrol killed an officer and wounded another soldier in Tal Afar. In another separate incident a man was killed in a rocket attack. On June 11, 2007 two people were killed and five wounded by a Katyusha rocket attack. On June 19, 2007 a woman and a child were killed by a mortar attack in the town. On July 12, 2007, seven guests celebrating the wedding of an Iraqi policeman were killed by a suicide bomber. On July 15, 2007 two civilians were killed and three wounded by a roadside bomb. On August 6, 2007, a car bomb killed 27 and wounded 28 people in the nearby village of al-Guba. On August 22, 2007, a roadside bomb exploded near workers laying water pipes, killing two and wounding five. On September 16, 2007 at least two policemen were wounded by a roadside bomb in the centre of the town. On September 22, 2007 one insurgent was killed and another wounded when a bomb they were making exploded. On September 24, 2007 a suicide truck bomb killed at least six people, including two policemen and a soldier, and wounded 17 in an attack on a checkpoint near a village between Tal Afar and Mosul. On October 4, 2007, a suicide car bomber killed three people and wounded 57 in a market. On October 10, 2007 a Katyusha rocket landed on a house, killing five members of the same family and wounding five others. On December 29, 2007 police killed five insurgents and detained five others. On January 3, 2008 two civilians, including a child, died when U.S. forces returned fire after a roadside bomb struck a convoy that included the police chief. On January 19, 2008 a rocket attack killed seven people and wounded 20., On February 15, 2008 at least three people were killed and 16 wounded in a double suicide bombing. After a police officer guarding a mosque prevented a bomber from entering the building, the attacker tried to throw a hand grenade and then detonated the explosive vest he was wearing. A few minutes later, another bomber ran towards a group of worshipers and blew himself up as police opened fire. On February 20, 2008 a suicide car bomber killed a woman and a six-year-old girl, and wounded eight, in an attack on an identity cards office. On March 2, 2008 clashes between gunmen and police killed 13 gunmen and two policemen in a village near the town. On April 14, 2008 an attacker wearing a suicide vest blew himself up at a Shi'ite funeral, killing four civilians and wounding 22. On May 27, 2008 four people were killed and 46 wounded, including two children, when a parked car bomb blew up in a market, the town's mayor, Najim Abdullah, said. On July 8, 2008 gunmen killed a member of the Sunni Arab Iraqi Islamic party, police said. On July 12, 2008 police found the bodies of seven people, including a woman and a child, the town's mayor said. They had been kidnapped two days earlier. On July 17, 2008 a car bomb exploded in a street market killing 20 people, including nine children, and wounding 90. On July 31, 2008 a roadside bomb killed a policeman, police said. On August 8, 2008 a lone Sunni Turkman suicide bomber (initial reports said a parked car) exploded in a vegetable market killing 25 people and injuring about 70. On August 29, 2008 policemen killed a would-be suicide bomber who tried to enter a mosque. On September 6, 2008 a car bomb exploded near shops and cafes killing at least six people and wounding at least 50. On September 17, 2008 a roadside bomb wounded four civilians. On September 18, 2008 two roadside bombs wounded nine civilians. On September 20, 2008 a suicide car bomb attack near a football playground killed two people and left 18 wounded. On November 15, 2008 a car bomb exploded and killed 10 people and injured 31 more. On December 2, 2008 a suicide car bomb exploded at a police checkpoint killing five people and wounding 30. On February 6, 2009 gunmen in a moving car opened fire and killed two civilians, police said. On March 23, 2009 a suicide bomber killed an off-duty police officer and wounded five civilians, according to police. On July 9, 2009 33 people were killed by two suspected suicide bomb attacks. Police reported that more than 70 were injured. On September 17, 2009 a suicide bomber drove a truck into a police checkpoint, killing three civilians and wounding three policeman. On September 28, 2009, two suspected insurgents were killed and a third was wounded in an explosives accident. On October 16, 2009, a gunman opened fire and then detonated a suicide belt, killing 15 and injuring 100 during Friday Prayer inside the Taqua Mosque, which is attended primarily by Sunni Muslims. On 14 May 2010, an attacker detonated explosives hidden inside a vehicle at the entrance to the football stadium, killing ten people and injuring 120 others. Earlier, the Islamic State of Iraq, warned Shiites of "dark days soaked with blood". "What is happening to you nowadays is just a drizzle," said Abu Suleiman al-Naser, the group's "minister of war". On March 7, 2012, at least 12 people were killed in a coordinated car- and suicide bombing attack. ISIS captured Tal Afar on June 16, 2014, after a two-day battle. On 20 August 2017, the Iraqi Army announced it had launched a new offensive to retake Tal Afar from the Islamist forces. On the same day, it recaptured four neighborhoods in Tal Afar (Abra al-Najjar, Abra Hansh, al-Abra al-Kabira, and Abra al-Saghir)  The city itself was recaptured by Iraqi forces on August 27, 2017. The remaining of ISIS-held area in Tal Afar district were then fully captured on August 31, 2017. ^ a b "Sunni militants seize Tal Afar city of 200k citizens enlarging control of Iraq". RT International. ^ Also romanized Tal'Afar, Tall Afar, Tell Afar or Tel Afar. ^ a b google maps, Tel Afar. Retrieved 8 May 2015. ^ "Description of Tal'Afar" (PDF). Department of Behavioral Sciences & LeadershipUnited States Air Force Academy, Colorado Springs. January 8, 2008. Archived from the original (PDF) on August 16, 2010. Retrieved April 22, 2011. ^ Encyclopedia of Prehistory, by Peter N. Peregrine, Melvin Ember, Inc., Human Relations Area Files, Pg 149. ^ Nineveh and Its Remains, by Austen Henry Layard, 1867, pgs 217–218. ^ The Other Kurds: Yazidis in Colonial Iraq, by Nelida Fuccaro, 1999, pg 33. ^ Sitzungsberichte. Abt. 1, Biologie, Mineralogie, Erdkunde und verwandte Wissenschaften. 1953. p. 392. ^ "Tall ?Afar Airbase". www.globalsecurity.org. ^ Schlosser, Nicholas J. (August 2015). "The Pacification of Tal Afar". U.S. Army Center of Military History. Archived from the original on 5 September 2015. ^ Najim Abed al-Jabouri (28 October 2009). "For every Iraqi party, an army of its own". New York Times. Retrieved 3 August 2016. ^ "بالصور...من سيقود عمليات الموصل ؟". Rudaw. Retrieved 2017-08-12. ^ "Operation Black Typhoon". www.globalsecurity.org. ^ "Northern Exposure - FDD's Long War Journal". www.longwarjournal.org. 23 September 2005. ^ "Operation Restoring Rights". www.globalsecurity.org. ^ Poole, Oliver (2005-12-19). "Iraqis in former rebel stronghold now cheer American soldiers". The Daily Telegraph. Retrieved 2012-05-09. ^ "President Discusses Democracy in Iraq with Freedom House". White House Office of the Press Secretary. 2006-03-29. Retrieved 2007-04-10. ^ "Police and Militants Gun Down Sunnis in Revenge Attacks". ^ Fitzsimmons, Michael (March 2013). GOVERNANCE, IDENTITY, AND COUNTERINSURGENCY: EVIDENCE FROM RAMADI AND TAL AFAR (PDF). STRATEGIC STUDIES INSTITUTE and U.S. ARMY WAR COLLEGE PRESS. ISBN 1-58487-567-4. Retrieved 22 May 2015. ^ "FACTBOX-Security developments in Iraq, Feb 10". Reuters. 10 February 2007. ^ "FACTBOX: Security developments in Iraq, Feb 22". Reuters. 22 February 2007. ^ "FACTBOX-Security developments in Iraq, March 24". Reuters. 24 March 2007. ^ "FACTBOX-Security developments in Iraq, April 14". Reuters. 14 April 2007. ^ "FACTBOX: Security developments in Iraq, May 21". Reuters. 21 May 2007. ^ "FACTBOX-Security developments in Iraq, May 31". Reuters. 31 May 2007. ^ "FACTBOX-Security developments in Iraq, June 11". Reuters. 11 June 2007. ^ "FACTBOX: Security developments in Iraq, June 19". Reuters. 19 June 2007. ^ "Seven killed by suicide bomber at Iraqi wedding". Reuters. 12 July 2007. ^ "FACTBOX: Security developments in Iraq, July 15". Reuters. 15 July 2007. ^ "FACTBOX-Security developments in Iraq, Aug 22". Reuters. 22 August 2007. ^ "FACTBOX: Security developments in Iraq, Sept 16". Reuters. 16 September 2007. ^ "FACTBOX-Security developments in Iraq, Sept 22". Reuters. 22 September 2007. ^ "FACTBOX: Security developments in Iraq, Sept 24". Reuters. 24 September 2007. ^ "FACTBOX-Security developments in Iraq, Oct 4". Reuters. 4 October 2007. ^ "FACTBOX-Security developments in Iraq, Oct 10". Reuters. 10 October 2007. ^ "FACTBOX-Security developments in Iraq, Dec 29". Reuters. 29 December 2007. ^ "FACTBOX-Security developments in Iraq, Jan 3". Reuters. 3 January 2008. ^ "Breaking News, World News & Multimedia". New York Times. ^ a b "Humanitarian - Thomson Reuters Foundation News". news.trust.org. ^ "FACTBOX-Security developments in Iraq, March 2". Reuters. 2 March 2008. ^ "Attacks kill up to 18 in northern Iraq". Reuters. 14 April 2008. ^ "FACTBOX - Security developments in Iraq". Reuters. 27 May 2008. ^ "FACTBOX-Security developments in Iraq, July 8". Reuters. 8 July 2008. ^ "FACTBOX-Security developments in Iraq, July 12". Reuters. 12 July 2008. ^ Robertson, Campbell (17 July 2008). "Blast Kills 20 in Shiite Neighborhood of Northern Iraq City". New York Times. ^ "FACTBOX: Security developments in Iraq, July 31". Reuters. 31 July 2008. ^ "Car bomb kills 21 in Iraq market". BBC News. 8 August 2008. ^ "FACTBOX-Security developments in Iraq, Aug 29". Reuters. 29 August 2008. ^ Goode, Erica (6 September 2008). "Car Bomb Kills 6 in Northwestern Iraq". New York Times. ^ "FACTBOX-Security developments in Iraq, Sept 17". Reuters. 17 September 2008. ^ "FACTBOX-Security developments in Iraq, Sept 18". Reuters. 18 September 2008. ^ "FACTBOX-Security developments in Iraq, Feb 7". Reuters. 7 February 2009. ^ "FACTBOX-Security developments in Iraq, March 23". Reuters. 23 March 2009. ^ "Scores killed in Iraqi bombings". Al Jazeera. 9 July 2009. ^ "FACTBOX-Security developments in Iraq, Sept 17". Reuters. 17 September 2009. ^ "FACTBOX: Security developments in Iraq, Sept 28". Reuters. 28 September 2009. ^ Williams, Timothy (16 October 2009). "Attacker Kills 15 in Iraqi Mosque". New York Times. ^ "Deadly bombing hits Iraqi stadium". BBC News. May 14, 2010. Retrieved May 24, 2010. ^ Iraqi city of Tal Afar falls to Isis insurgents Martin Chulov, The Guardian, June 16, 2014. ^ "Iraq launches push to seize Tal Afar". 20 August 2017 – via www.bbc.com. ^ "Exclusive: Federal Police recapture 4 neighborhoods in Tal Afar - Iraq News - Local News - Baghdadpost". www.thebaghdadpost.com. 20 August 2017. Wikimedia Commons has media related to Tal Afar. Hondros, Chris (January 19, 2005). "A shooting after nightfall". Newsday. Packer, George (April 10, 2006). "The Lesson of Tal Afar". The New Yorker.